This is a poster I recently made for international engineering company Arup. 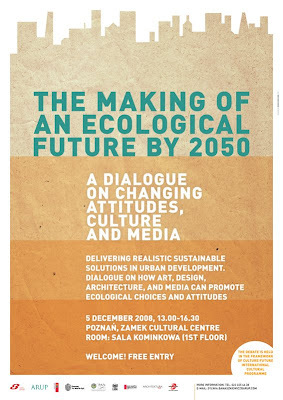 It's an invitation to a debate about how to raise ecological awareness through art, design, architecture and media. The meeting is held in Poznań, Poland. As you can see the client had a lot of text to highlight in the poster. I had no room for images so I went for a minimalistic layout with warm colours. The paper background ads an eco feeling to it. This is the cover of a catalogue I have recently designed. It's small (165mm x 155mm) but 314 pages thick. It was made as a follow-up to an exhibition and academic conference about contemporary icon painting (writing?) that took place in Warsaw this summer. 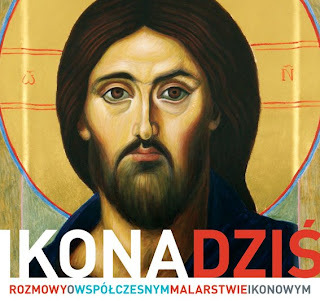 The catalogue has been published with funds from the City Council of Warsaw. The same book will also be published as an art album – with a slightly altered cover. It will be out in the shops this December. A few years ago Siedmioróg published the first book in the Mikropolis series, The Tourist Guide (Przewodnik turystyczny). Egmont will publish an extended reedition this December and I have reinvented the design completely. All illustrations are made by Krzysztof Gawronkiewicz. Above is the new cover. The original cover from 2001. 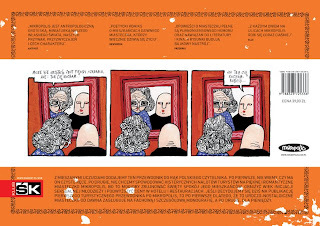 Mikropolis is a comic published since 1994 in loads of Polish magazines and newspapers. Two hardcover books have been published so far. Illustrations by Krzysztof Gawronkiewicz, scripts by Dennis Wojda.